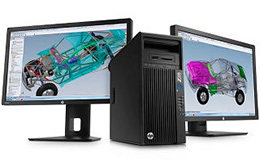 Correctly specified computer hardware is at the heart of any good CAD software solution, and potential gains in business productivity can be quickly eroded by the lack of investment in the right computer hardware. Graitec USA, Inc. has been a top tier provider to the CAD and design industry for many years and have a pedigree in supplying computer hardware, CAD workstations, CAD laptops and large format printer and plotters to both local businesses and multi-national corporations. Today's modern CAD software solutions tend to test the limits of computer hardware, graphics cards and networks as the software is designed to calculate solutions in the fasted possible times in order to give businesses the very best return on investment and productivity. Best in class software is also designed to be able to take advantage of future expected computing and hardware performance increases. So investing in or getting by with computer hardware that is close to minimum specs often directly correlates to a hidden cost of lost productivity as the cad software hits computing, memory or system bottlenecks. Large format printers (also known as large format plotters or wide format printers) are also an integral part of any CAD office and with businesses looking at both speeds of print and also printing costs it quite often no longer makes sense to carry on using obsolete plotters an printers. Graitec USA, Inc. supplies both new and HP refurbished units, which gives a huge saving to businesses seeking modern printing solutions at the best possible price breaks. To discuss your computer hardware or large format printing requirements, or to arrange a consultation simply give us a call on (281) 445-6161.